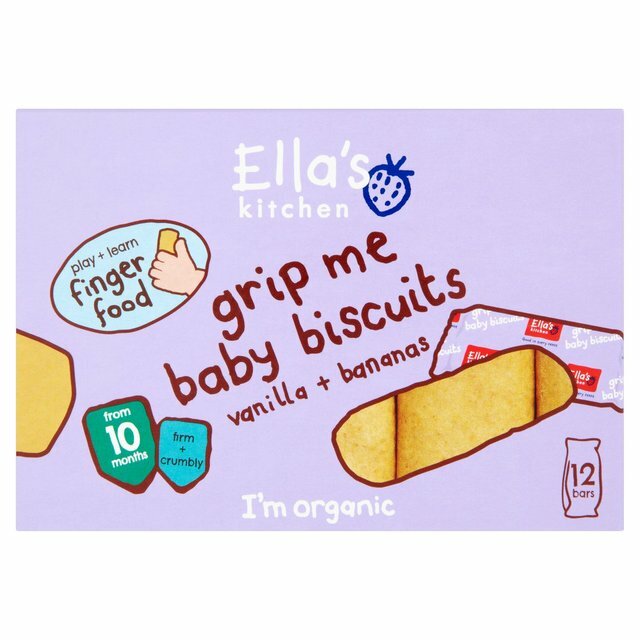 Hello, I'm 12 individually wrapped yummy organic vanilla, banana, wheat + rice baby biscuits. I'm the perfect finger food for babies to grab, grip + eat and am just the right size and shape for little ones learning to feed themselves. I'm firm enough for little gums to chew, yet soft enough to melt in little mouths. Who am I for? I'm made for babies from 10 months. 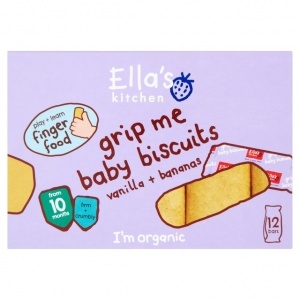 If your little one is getting to grips with grabbing food, my baby biscuits are great for learning how to start holding and eating firmer textures. Keep me in a cool, dry cupboard until I'm munched. Warning: I'm not suitable for little people under 10 months old. When a child over 10 months is munching me make sure they're sitting down and are supervised by an adult to reduce the risk of choking.